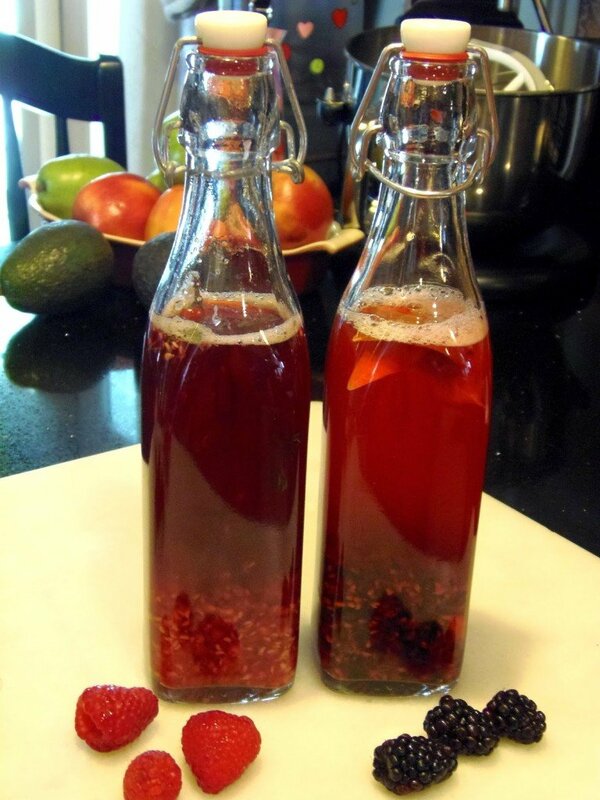 Homemade Raspberry Thyme Vinegar and Blackberry Laurel Vinegar are very easy to make and are super fun to cook with. 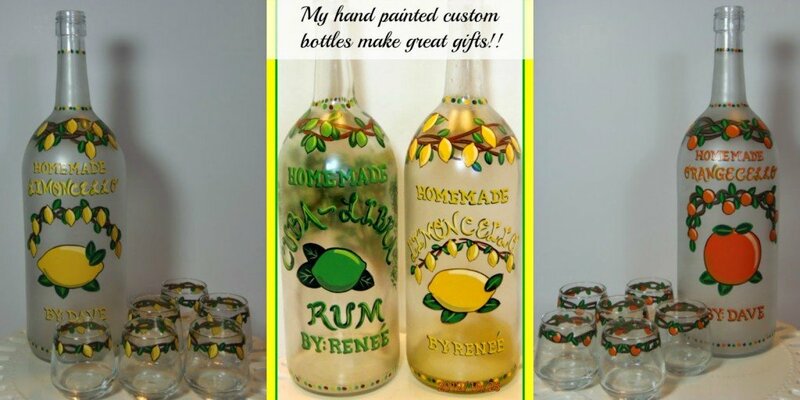 They also make great gifts for anyone who loves to cook, and they’re totally customizable to your favorite flavors. Hi all! 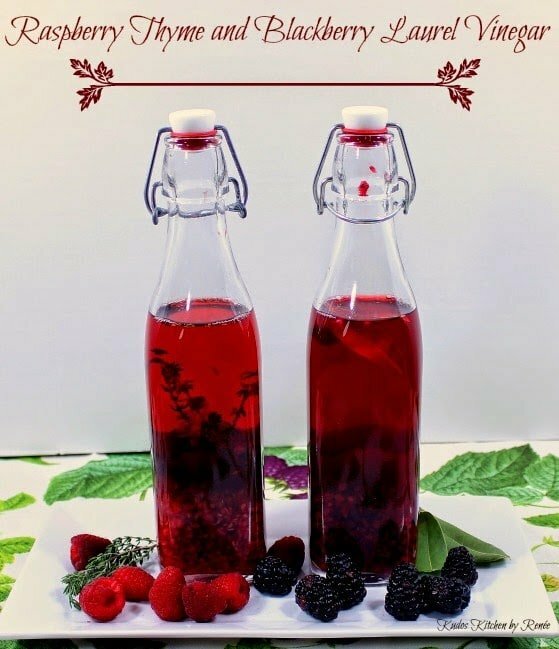 With flavored vinegars being so popular lately I wanted to try my hand at creating a few custom flavors with some of my favorite berries and herbs. 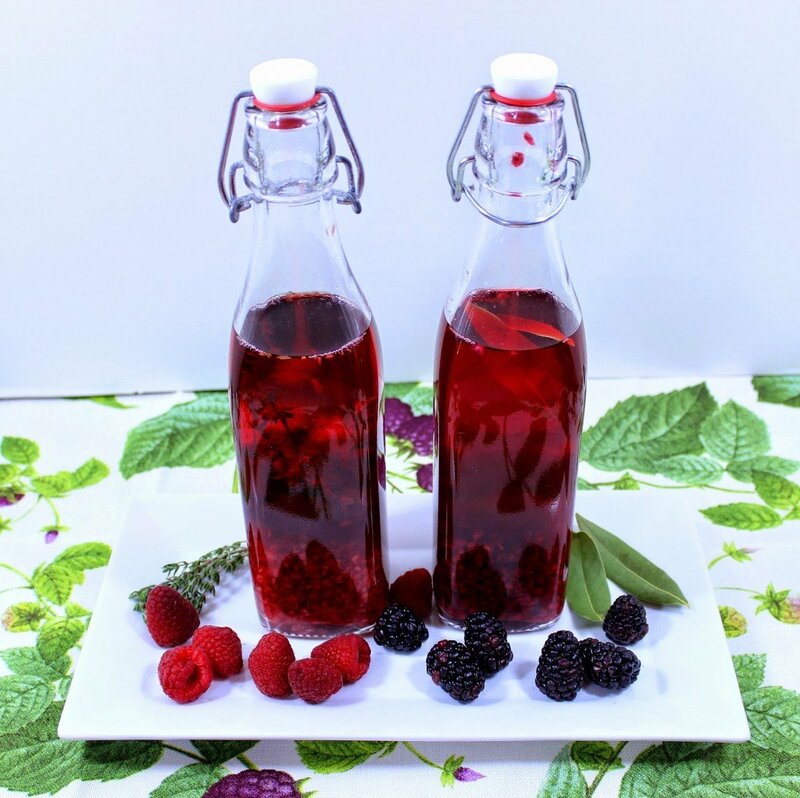 With just a few simple ingredients and some attractive storage bottles (I purchased mine at my local grocery store for $2 each) you can whip together your own flavored vinegars for just a fraction of the cost of what you’ll find in those pricey kitchen speciality stores or markets. 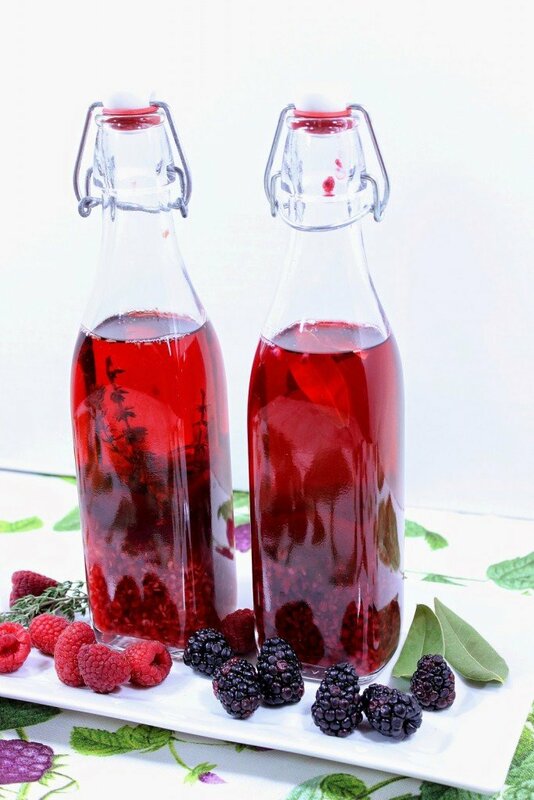 Assemble the berries, white and red wine vinegars, thyme sprigs, bay (laurel) leaves, storage bottles and a medium size bowl. 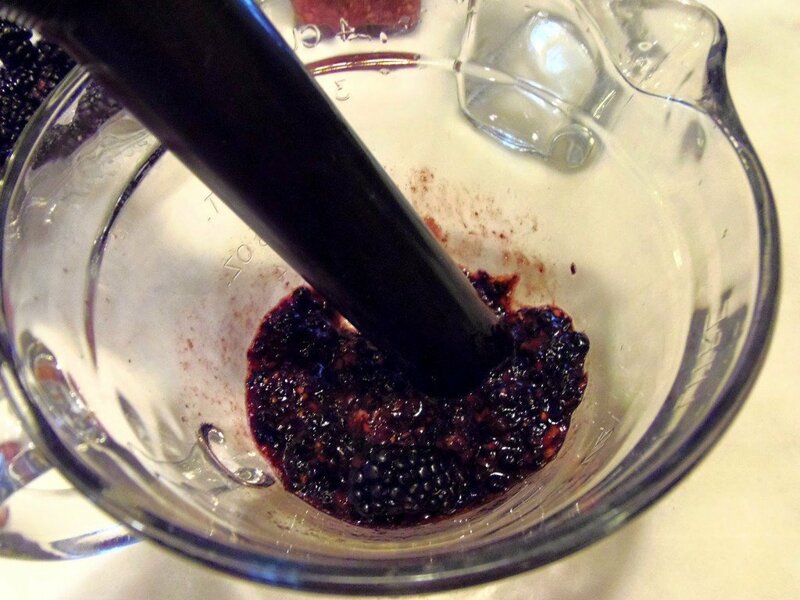 Working in two batches, muddle the berries in the bowl. 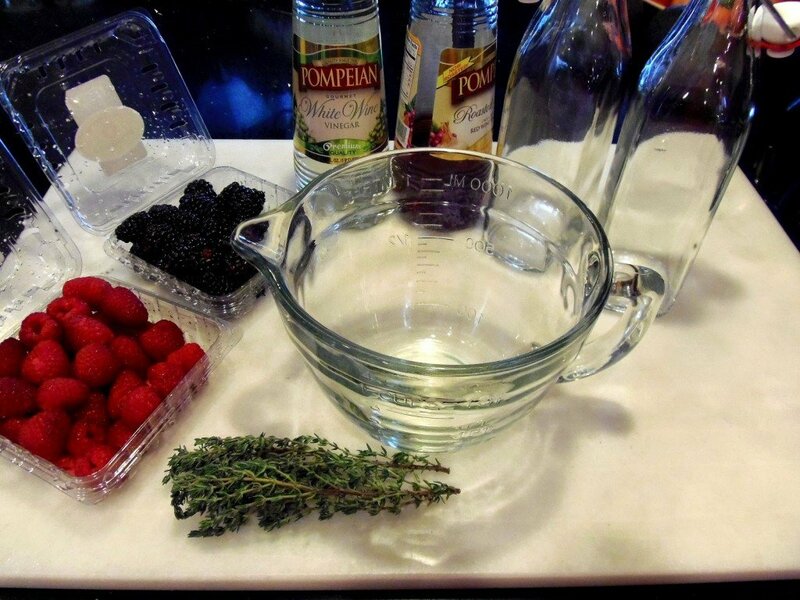 Add the herbs to the bottles. 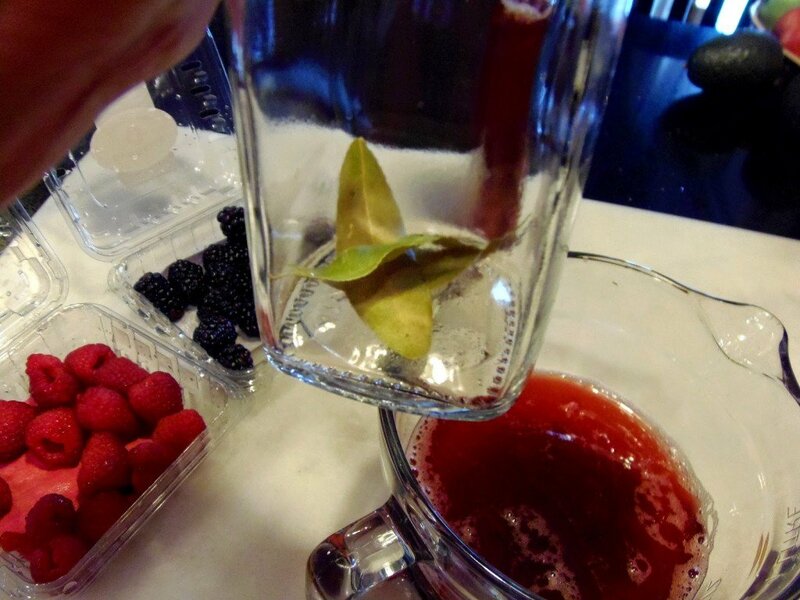 Pour the vinegar into the muddled fruit and stir well. 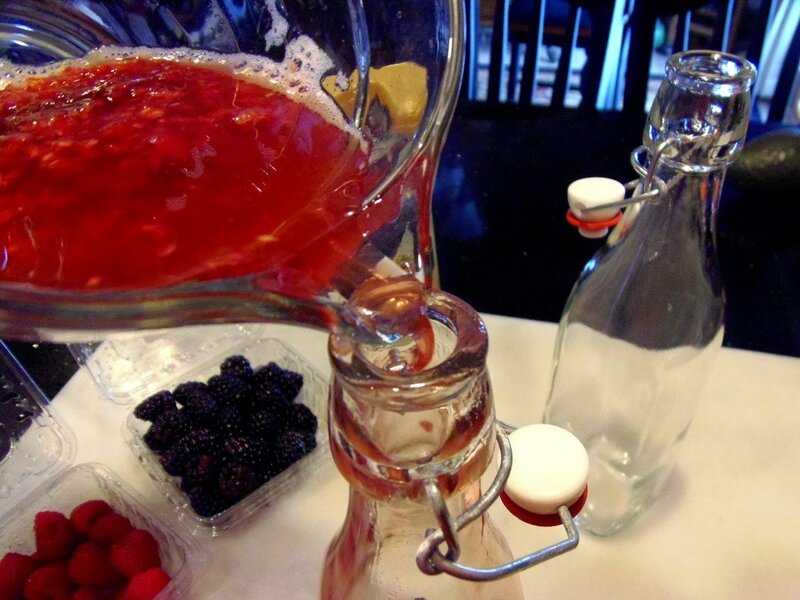 Pour the vinegar/fruit mixture into the prepared bottle. 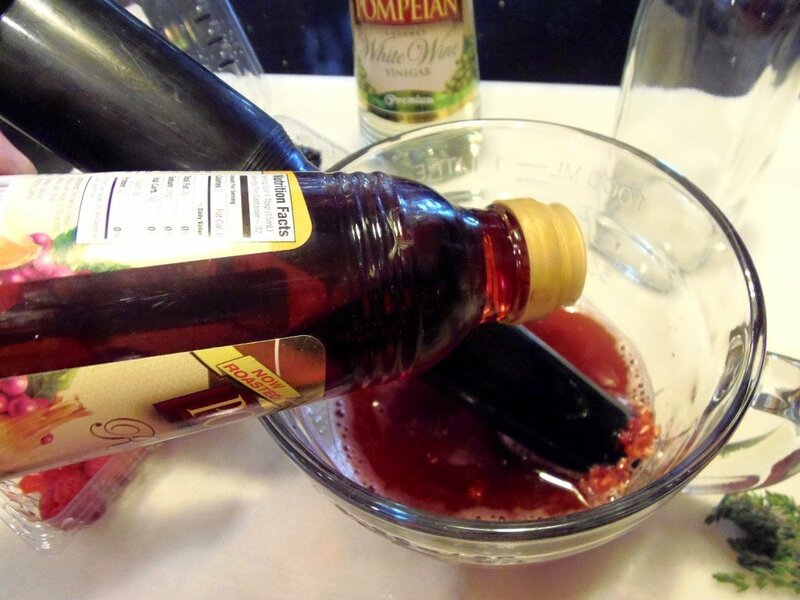 Place the lid on the bottle and allow the vinegar to sit on the counter for 7 days before use. Strain if desired. I found it unusual and interesting that the two different flavored vinegars turned out to be almost exactly the same color. 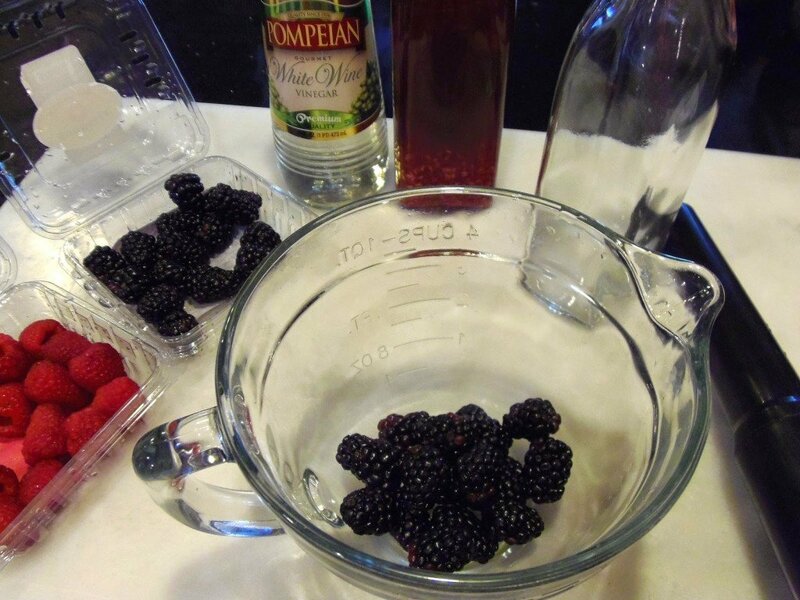 I had thought that the blackberries mixed with white wine vinegar would have been a deep blueish hue, but surprise…not so much. 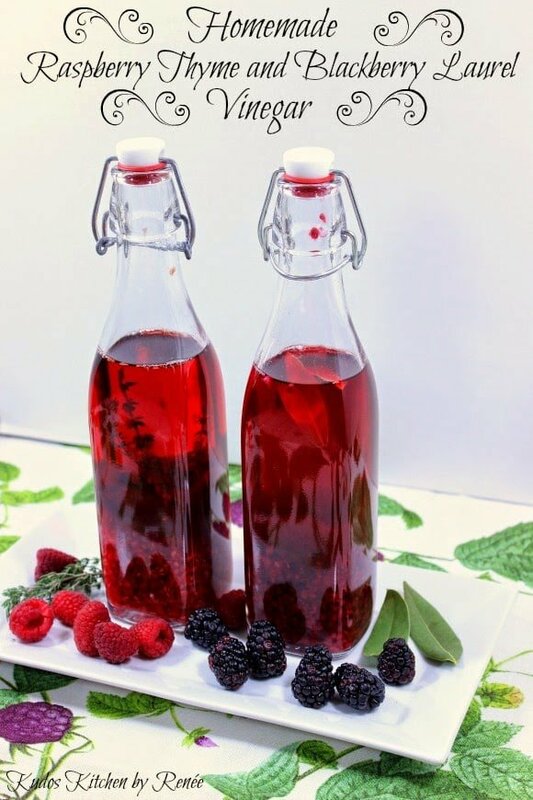 However, the flavors are completely different and you can totally differentiate between the flavors of the berries, and the herbs… so it’s all good! 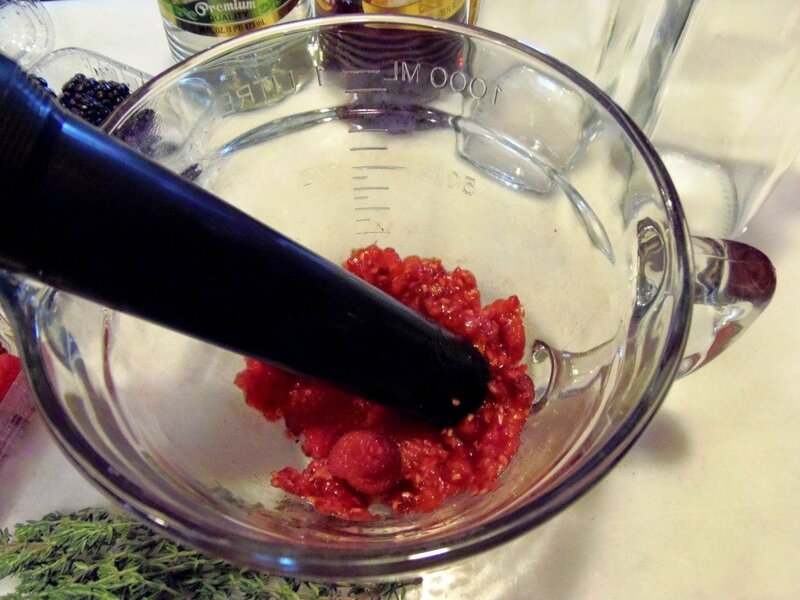 -Muddle the berries in a medium size bowl. Stir in the red wine vinegar. 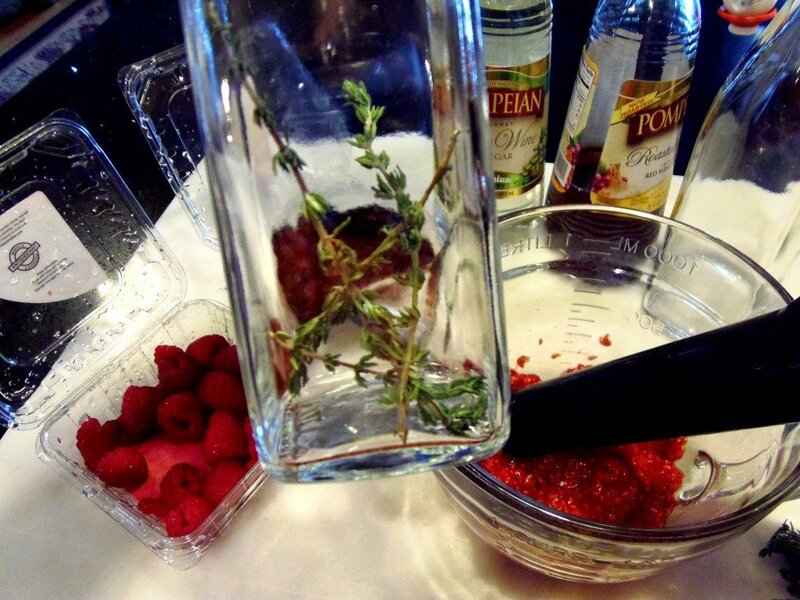 Add the thyme sprigs to the decorative bottle. 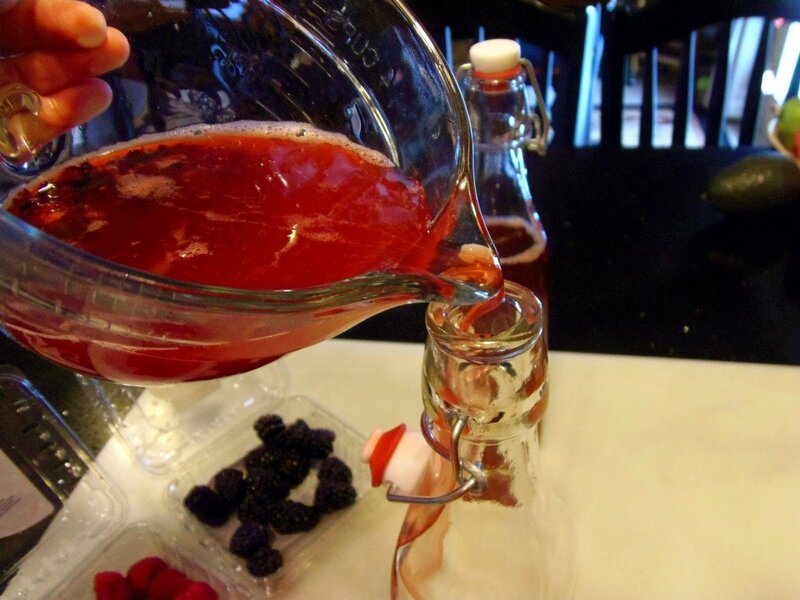 Pour the vinegar/fruit mixture into the bottle. Cover and allow to sit for 7 days before use. Strain if desired.